04:10:00 Makes 8 servings, one parfait (87 g) each. Makes 8 servings, one parfait (87 g) each. These pretty parfaits layer two shimmering colours of fruit-flavoured jelly cubes with creamy whipped topping. With only 10 minutes of prep, you can't go wrong with these JELL-O Parfait desserts. Stir 1 cup of the boiling water into each flavor of dry jelly powder in separate medium bowls at least 2 min. until jelly powder is completely dissolved. Stir 1 cup of the cold water into jelly in each bowl. Pour into separate 9-inch square pans. Refrigerate 4 hours or until firm. Cut jelly in each pan into 1/2-inch cubes. 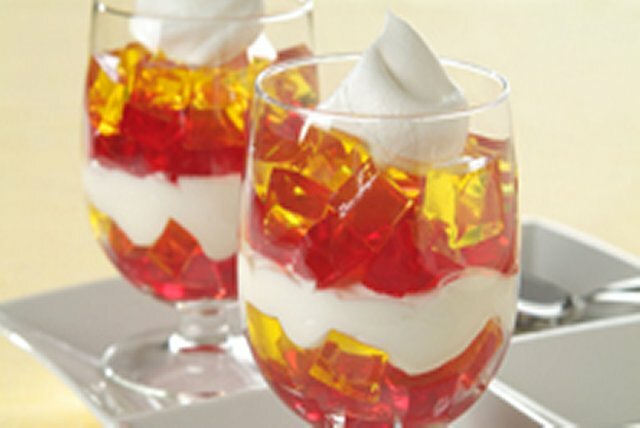 Layer jellies and whipped topping alternately in eight parfait or dessert glasses. Store in refrigerator. For an extra fruit burst, stir 3/4 cup of your favourite cut-up seasonal fresh fruit into the whipped topping before layering in parfait glasses as directed. Serving Size Makes 8 servings, one parfait (87 g) each.